Deciding to buy or rent a multifunction photocopy machine is definitely a considerate decision. There are so many factors that must be considered to get a right multifunction machine for your office needs. Surely, in choosing a multifunction photocopy machine, what you are looking for is a machine that has superior features with the best print quality, because one of the factors that you need to consider is the print result quality. Also, how your printing machine can give the best results from the first sheet to end. Photocopy machine that can be used by offices that are concerned with the quality of prints, not just the low price. Multifunction photocopy machine is also known as an Office Multifunction machine. It is a multifunctional photocopy machine for office scale which has the function for photocopy, print, scan, and fax. In Indonesia multifunctional photocopy machine come from several brands. One of the very first brands is Xerox or in Asia known as the Fuji Xerox. This brand has been well-known for its Xerography technology and Fuji Xerox has consistently developed features and software to keep high-quality printing results that still efficient in terms of toner usage. In Fuji Xerox Office Multifunctional machine, there is a software that can help maintain the stability and consistency of colors in print result, starting from the first sheet to the end. Of course, the stability and consistency of colors is one thing that is very important to maintain, why so? Because as we know, if we print documents in color continuously and in large volumes, it can cause the color quality of the Office Multifunction machine to drop and this is normal even though on a production scale machine. That is why, to keep the high- quality color print result and consistent with the color standards, some types of Fuji Xerox Office Multifunctional machines already have a solution to maintain the stability and consistency of the colors. It is called Simple Image Quality Adjustment (SIQA). SIQA is one of the solutions present on several Office Multifunction machines. SIQA can be said as software that supports and simplifies the performance of Office Multifunction machines. With SIQA the print quality can be adjusted automatically by printing or scanning a measurement chart on Office Multifunction machines. So in operation, the operator does not have to adjust the color stability and consistency manually because SIQA can do it all. SIQA allows customers to be able to adjust the image transfer and alignment, also improve the print quality that focuses on color density, spots & scratches, paper quality used at the time of printing and the printout result. SIQA can help you to solve color calibration that occurs when printing. 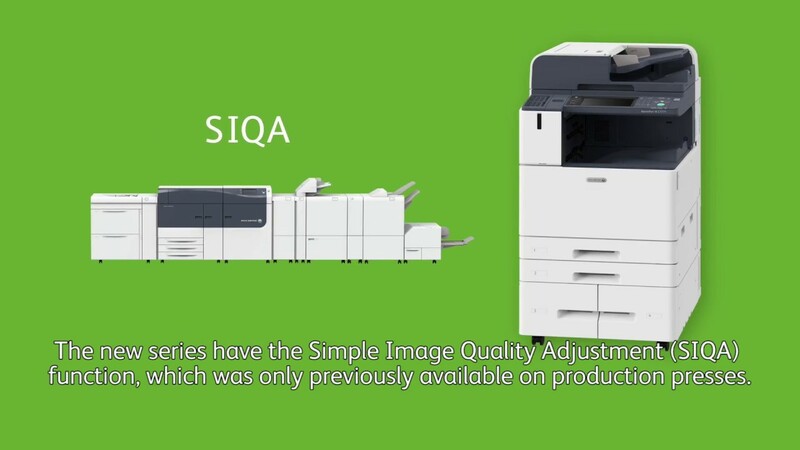 If the density or color reproduction for photocopies and prints decreases, SIQA will solve it automatically, so the printout remains in normal condition. But if there is no SIQA on your machine, then you have to manually set it to get the same results as the previous prints. SIQA can also help you with color registration issues. If during the printing process there is a misalignment in the four-color superposition of Cyan, Magenta, Yellow, and Black (CYMK), then SIQA can handle it automatically to Adjust Color Registration. So the copy and print results remain at their normal point even though in large volumes. During the Duplex (back and forth) printing process, of course, we need the right alignment. When front and back print results in misalignment, SIQA becomes a solution that can automatically adjust the alignment so that the result can be more precise without having it to be manually set by the operator. When an uneven density appears between the front and back sheets during the printing process, SIQA will automatically do the adjustments. SIQA will perform voltage optimization (voltage in accordance with the characteristics of thickness and type of paper, for example, heavyweight / coated). With the support of SIQA various features on some Fuji Xerox Office Multifunctional machines, it is expected it can help and maintain color stability and reduce printing costs. The print out results, photocopy and print become better and consistent from the first sheet to the end (1 - 9999.9999). You can have Fuji Xerox Office Multifunctional Machines by contacting Astragraphia Document Solution on Halo Astragraphia 1500-345. Astragraphia is Fuji Xerox's exclusive distributor in Indonesia. Competition is not always bad in business. Competition forced companies to innovate, providing better services for the customer. This is what Astragraphia do that results in 3HDT (3 Hours Down Time) service. What is 3HDT? How to develop this idea? How to run it? How it impacts on business performance? Mr. Soebandi Tjandrajaya, Chief of Customer Service & Support Division PT Astra Graphia Tbk shares his story about the development and implementation of 3HDT. Protecting sensitive documents from unauthorized duplication is a growing concern. Counterfeit copies of documents like coupons, tickets, and invoices can have serious financial impacts. In order to combat this concern, Fuji Xerox comes up with Xerox® Specialty Imaging, a specialty imaging effects that can be read based on its reading tool.